After 16 races, the series finale for the 2011 IZOD INDYCAR Series takes place on the Las Vegas Motor Speedway. Staging the IZOD INDYCAR World Championship Presented by Honda, North America's top open wheel racing tour presents the largest entry list since the Indianapolis 500 in may with 34 cars ready to race Sunday's 200-lap event. Friday's qualifying on the 1.5-mile oval meant a lot for many drivers and teams wanting to make this last race of the season count. The driver scoring the top qualifying run for the IZOD INDYCAR World Championship Presented by Honda was the #82 car of Tony Kanaan. Lapping the Las Vegas race track in a two-lap average speed of 222.078 miles per hour, the Lotus/KV Racing Technology car earns his first pole position of the year (however, he did start at the front via a qualifying draw during the double race at Texas Motor Speedway). Prior to the 2011 IZOD INDYCAR Series season, the 2003 champion Tony Kanaan was sent for a loop when a planned drive with de Ferran/Dragon Racing was derailed due to lack of team finances. In a late deal, Lotus/KV Racing Technology give the popular Brazilian a ride driving the #82 machine. 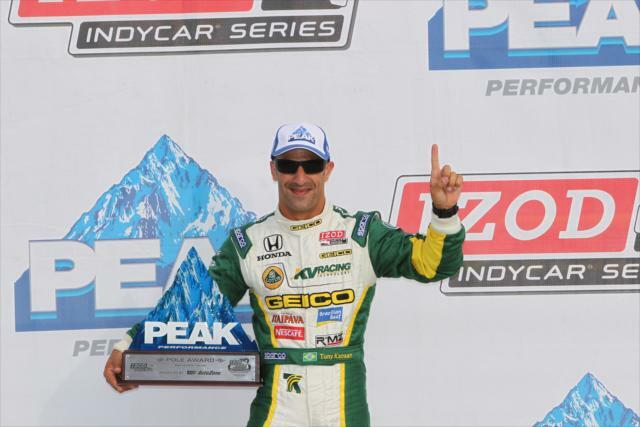 Seen initially as a puzzling move for Tony Kanaan, KV Racing Technology's 2010 season performance was mixed at best. Spending most of the season repairing their dwindling supply of Dallara chassis the previous year, Lotus/KV Racing Technology and Tony Kanaan surged to redemption in the first IZOD INDYCAR race of the season at St Petersburg with a 3rd place finish. The rest of the season has shown some great potential from the #82 car. 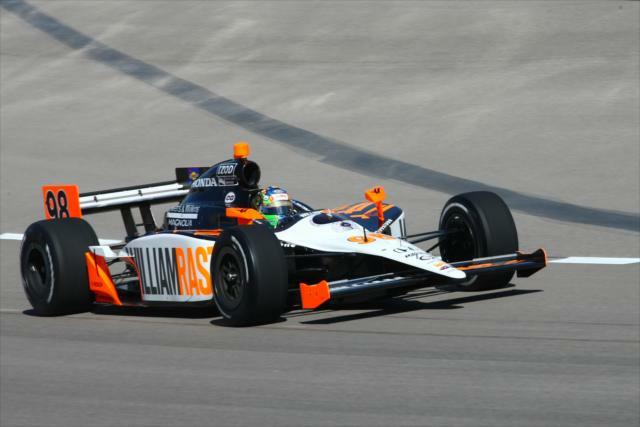 Only 17/100th of a second slower than Kanaan's time in qualifiying is Oriol Servia. Earning a front row start, Servia himself was a last-minute entrant to the 2011 IZOD INDYCAR race season announcing sponsorship just in time for the first event with his Newman/Haas Racing team. Starting third, recent surprise race winner of Kentucky Ed Carpenter drives what is likely the last race with the #67 Sarah Fisher Racing team (at least with Dollar General sponsorship). Recently displaced driver from his #77 car Alex Tagliani joins the field through a Sam Schmidt Racing associated Bryan Herta Autosport. Tagliani starts fourth in the #98 car that won this year's Indianapolis 500 with Dan Wheldon. Wheldon driving the #77 car will start 28th on Sunday. Filling the top-10 for the IZOD INDYCAR World Championship Presented by Honda at Las Vegas Motor Speedway is Ryan Briscoe, Marco Andretti, Ryan Hunter-Reay, Graham Rahal, Danica Patrick and Mike Conway. All four Andretti Autosport cars start in the top-10 including Danica Patrick who will be making her final IZOD INDYCAR Series race start before becoming a permanent fixture in NASCAR in 2012. At the forefront of the series finale, the intense championship battle in the IZOD INDYCAR Series has 18 points separating contenders Dario Franchitti and Will Power. In qualifying for the IZOD INDYCAR World Championship Presented by Honda, the complexion of the 2011 driver championship fight grows more interesting as the Power's #12 Penske Racing and Franchitti's #10 Target/Chip Ganassi car start in the middle of the field Sunday. Recording 2-lap qualifying efforts just under 8/100ths of a second apart, Power took a one grid position advantage at Las Vegas to start 17th. A repeat championship match-up between the two drivers, Dario Franchitti (starting 18th at the Las Vegas race) prevailed at Homestead in 2010. While Will Power and Dario Franchitti will be starting close in the final race settling the 2011 IZOD INDYCAR championship, a similar situation is transpiring for the tight Rookie of the Year fight. Canadian driver for Newman/Haas Racing James Hinchcliffe qualifying 14th holds a slim rookie points advantage on Panther Racing's JR Hildebrand. A race concluding the 2011 IZOD INDYCAR Series season, the 200-lap event at Las Vegas is set for 3PM Eastern time.